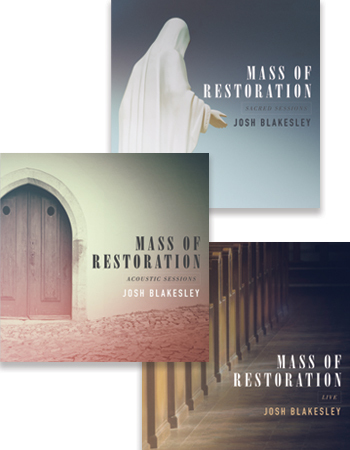 Featuring three separate recordings in various musical styles, Mass of Restoration will be cherished by traditional, contemporary and multigenerational faith communities. The first recording of this Mass setting, Acoustic Settings will appeal to anyone who enjoys music with a more modern feel, especially teens and young adults. It's simplicity also lends itself well to Life Teen groups, summer camps and other youth and young adult retreats. Designed to demonstrate how the Mass might be played in a church with multiple instruments — including strings, guitars and drums — the Live version can be adapted to meet many parish needs. 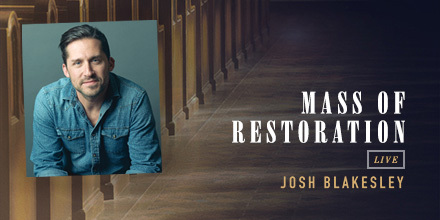 Josh Blakesley continues to serve one simple calling: to make music that moves people into prayer and action. 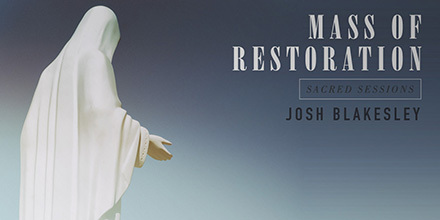 His Mass of Restoration is no exception. Co-written with his guitarist Grae McCullough, this Mass setting is at once both singable and truly beautiful. With three different recordings, the setting can be adapted to fit any parish's style — from contemporary to traditional. Josh and Grae were joined by bandmates Blake Powell and Christian Gaudet for the MP3 Album, which includes recordings of the Lenten Gospel Acclamations — the most complete set of any contemporary setting. Mass of Restoration serves to lead God's people deeper into prayer and participation as they come together week after week in worship. With three different recordings, the setting can be adapted to fit any parish's style — from contemporary to traditional. Josh and Grae were joined by bandmates Blake Powell and Christian Gaudet for the MP3 Album, which includes recordings of the Lenten Gospel Acclamations—the most complete set of any contemporary setting. The first recording of this Mass setting, Acoustic Settings will appeal to anyone who enjoys music with a more modern feel, especially teens and young adults. Designed to demonstrate how the Mass might be played in a church with multiple instruments — including strings, guitars & drums — the Live version can be adapted to meet many parish needs. With organ, strings and choir, Sacred Sessions mirrors the most common approach to liturgy in the Catholic Church. The Mass of Restoration trilogy would not have been complete without this final installment.